I am using commercially available .38 bullets for my improvised cartridges simply because they are readily available, but even if they were not a bullet mould can easily be acquired and bullets cast. Due to the wall thickness of our brass tube (thicker than that of a factory manufactured case) we cannot seat 'off the shelf' bullets without first resizing them to fit our handmade cases. For this purpose we must make a very simple sizing die to re- size our bullets to the correct diameter. The homemade re-sizing die is nothing more than a modified section of box section tubing. I am using 30 x 30mm tube with a wall thickness of 2.5mm. The length of the tube is also 30mm, just to keep things simple. 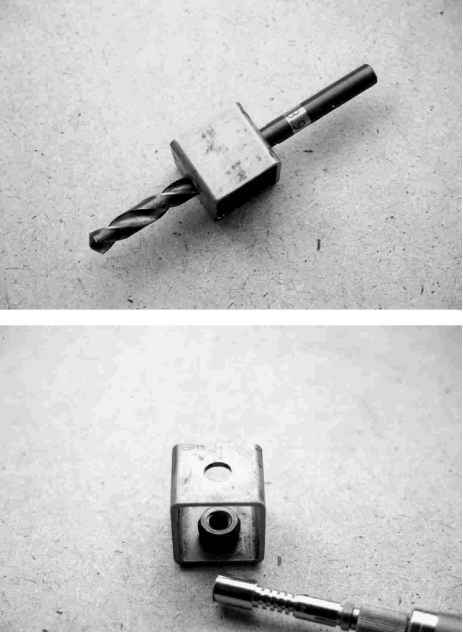 For accuracy of drilling a drill press must be used to make the die. 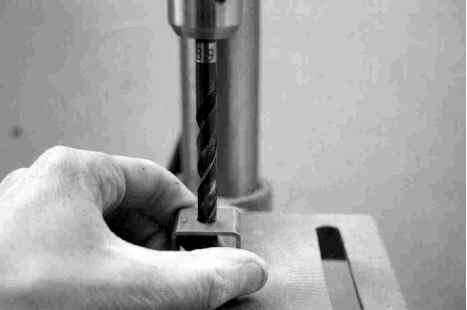 The first step is to drill a 2mm or 3mm pilot hole through the centre of the tube section. The hole must pass through both walls. Next, the hole is enlarged to 5mm or 6mm, and then the final 8.9mm hole is drilled (carefully and slowly) again making sure the drill passes through both walls. 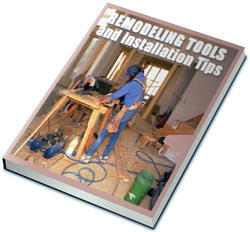 The holes can be made by simply holding the tube section on the drill table with your hand and drilling the holes. It is not necessary to clamp the tube or hold it in a vice. We now have the main body of a simple sizing die through which to pass our bullets. The next step is to simply solder an 8mm (M8) nut to the inside wall of the die in alignment with one of the holes, as shown in the above photo. Screw in the die bolt. 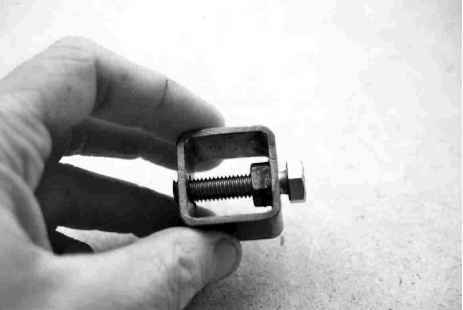 An 8mm bolt, 2" in length, is now screwed into the die. It should screw freely in and out. 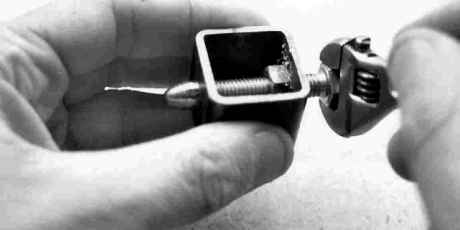 The bolt allows us to press the bullet through the opposite hole. The finished die is shown below. 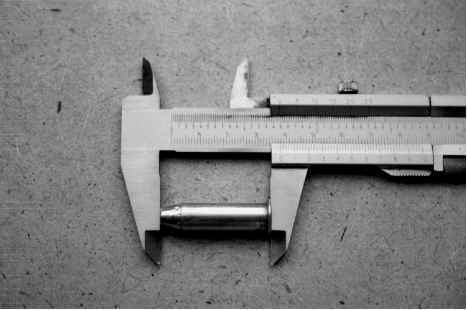 We must re-size our bullets to a diameter of 8.9mm in order for them to fit into our .38 cases. This diameter of bullet is obviously less than any factory made or home cast bullet, but still of sufficient diameter to engage the riffling of any .38 calibre handgun. Just as with our cases, we must compromise to get the job done. In the photo below I am sizing 9mm jacketed bullets because they are as near to the diameter we require as bought (9mm - .356") and less sizing will be required as a result. You can of course re-size any .38 lead bullet (.358" - 9.09mm) and from a re-sizing standpoint any lead bullet is easier to size than the jacketed variety. I am using jacketed bullets simply because that is what was available at the time of writing but it does illustrate that even the hard case of the jacketed bullet can be sized using this simple device. 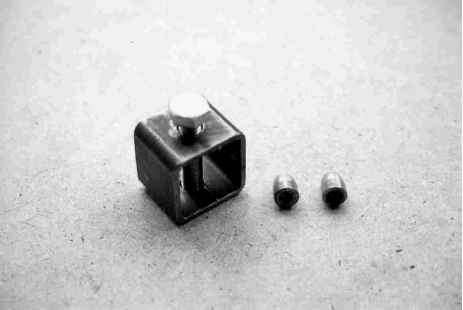 To size the bullet , place the bullet in the die as shown in the photo below and, using a spanner, slowly tighten the bolt. Screwing the bolt in will drive the bullet through the opposite hole sizing the bullet to a diameter of 8.9mm. I would suggest sizing perhaps fifty or so bullets in one session so as to have a ready supply. Press the bullet through the die.